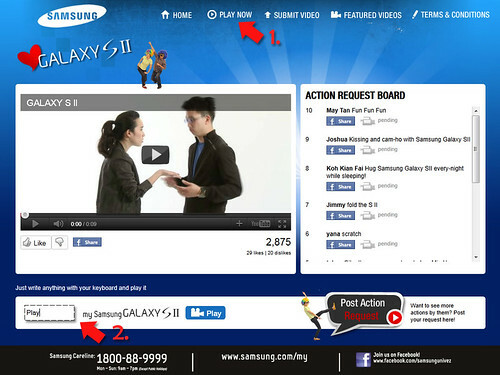 Have you visited the “I Love Samsung Galaxy S II” Campaign microsite developed by Samsung dedicated to Samsung Galaxy S II owners yet? One of the cool feature in the microsite http://bit.ly/pa8JrF is in the Play Now page as indicated as number 1 in the above picture. There’s a text box at the bottom left (indicated as number 2) for you to key-in any word you like to get the talents to act the words in the video. Just click the Play button, the video will start playing. Well, if you get bored after playing for a while, feel free to browse the videos submitted by Samsung Galaxy S II users too.